Will Oscar favourite Three Billboards buck the trend and win? The Oscars for 2017 will be handed out this weekend in Los Angeles, as awards season draws to a close – but with the last three favourites failing to win Best Film, can we pick out the winner this time around? OddsMonkey has taken a look to see if we can work out who is going to take away the big prize of Best Film. We have looked back through the last decade and see who landed the biggest movie awards pre-Oscar, and for this we are looking at the BAFTAs, the Golden Globes and both the Directors (DGA) and Producers Guilds (PGA) of America. 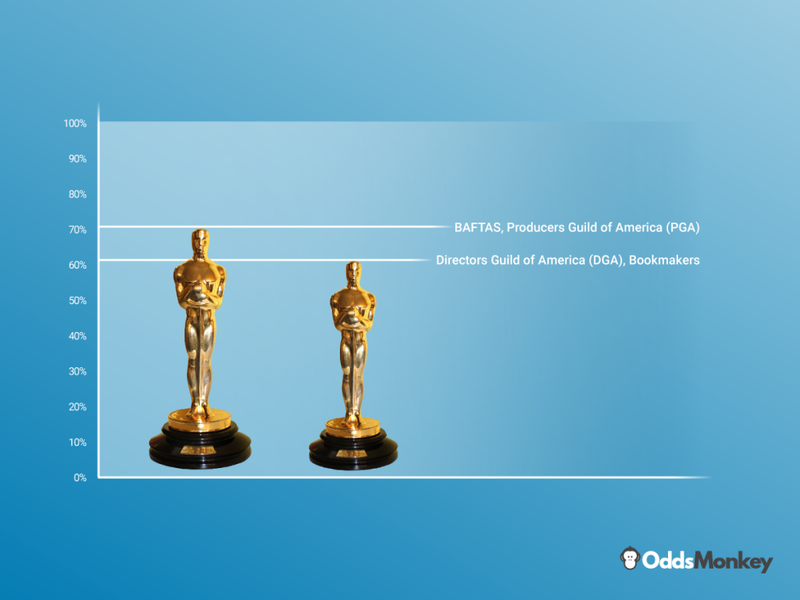 You can see that nobody has successfully mirrored the Oscars…but the BAFTAs and PGA lead the way with a 70% strike rate. 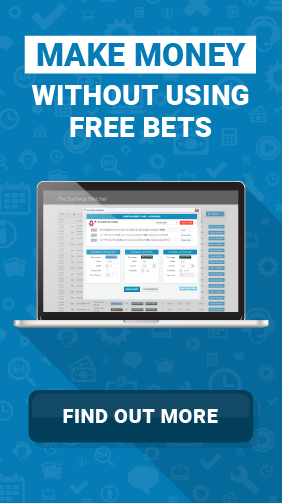 Until recently the Bookmakers and punters alike had a great record – up to 2014 when 12 Years A Slave won, it was almost becoming too easy for the Bookmakers to pick the winner. However, things have changed in recent times – with the last three winners being upsets, and last year’s failure of La La Land being one of the biggest upsets in Oscar history as they were 1/10 to win before losing out to Spotlight. The Producers Guild of America and the BAFTAs have faired the best, matching the winner seven from the last ten-years – 70% success rate that is just ahead of the Director’s Guild and the Bookmakers who have a slightly worse rate of 60% strike rate. This year looks to be panning out similar to last year with the BAFTAs and Golden Globes opting for the same winner in Three Billboards – they both predicted the winner last year in Moonlight. This time around the PGA and DGA have gone with the Shape of Water, like they did last year with La La Land. So could we look to the Bookmakers? 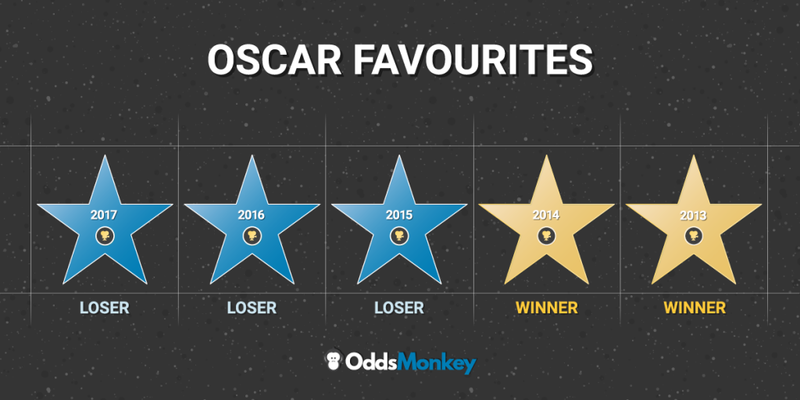 OddsMonkey spokesman Peter Watton said: “For many years the Bookies had the Oscars nailed down, landing the favourite every time – but they have not successfully predicted a winner since 12 Years A Slave. “So on form, Three Billboards is heading for the win – but the Shape of Water is getting shorter and the Bookmakers are struggling to separate them, so neither would be a shock – but is there a dark horse in the field? Ten-years ago in 2008 and that was one of the most interesting years in the battle for best picture as it was as a straight fight between Atonement and No Country for Old Men. Joe Wright’s Atonement won both the BAFTA and Golden Globe and was then firm favourite to win the Oscar, but he and his movie were not even nominated for the DGA and PGA honours who went with Joel & Ethan Cohen’s No Country for Old Men and the Bookmakers were quick to make the Cohen Bros film the favourite, and as it turned out the Academy members did indeed go with No Country for Old Men. After such a close run thing the year before, things could not have been different 12-months on when Slumdog Millionaire swept the board, winning every major honour and was odds on at 1/8 to win which is a near 90% probability – the only picture that was also getting a little mention at the time was the Curious Case of Benjamin Button, but Danny Boyle’s Indian-based feel good movie was not to be denied on Oscar night. The 2010 awards were again very different, when awards season began – all the talk was about Avatar, James Cameron’s epic 3D sci-fi and was the biggest grossing film of all time and all looked good as they took the Golden Globe, but then talk turned to Kathryn Bigelow’s Iraqi war drama The Hurt Locker and when that took the BAFTA and the DGA and PGA gongs, by the time Oscar night came around – The Hurt Locker was firm favourite, although only just with Avatar still at Evens, but the trend continued as Bigelow’s creation took the honours. This was very similar to 2010, when one film was deemed the favourite before being pipped. The Social Network was a highly popular movie all-around throughout 2010 and took the Golden Globe, and was odds-on at that point – but then came the late run from The King’s Speech, and they took all the other prizes, and perhaps the nail in the coffin for Social Network was when the PGA did not even nominate, and by the time Oscars came around, The King’s Speech was odds-on and it delivered. This was similar to when Slumdog Millionaire won. The Descendants starring George Clooney was popular early on and even won the Golden Globe, but that hype did not last long as the French black and white silent movie The Artist became the buzz movie in Hollywood, and dominated thereafter, and by Oscar night was 1/12 to win, which it did with ease. 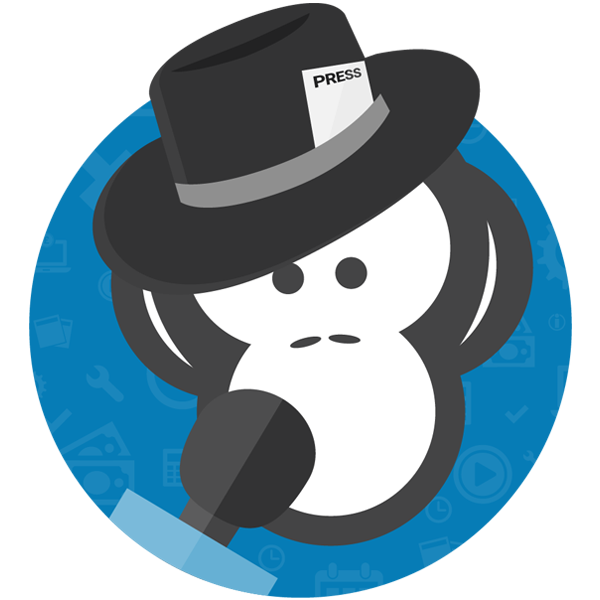 Going into the Oscars – the Artist is the shortest price for any movie to win in recent years. This was a one movie year again with Argo, directed and starring Ben Affleck dominating – despite some other heavy hitters being in contention with the likes of Life of Pi and Lincoln also in contention – but it was the CIA-based historical drama than swept the board. This is one of the most fascinating years in recent movie history and is very much looked back on as a vintage year in movie making. As it turned out, the brilliant 12 Years a Slave dominated, but it was very from easy going with sci-fi drama Gravity also considered a genuine contender, whilst there was also American Hustle, Captain Phillips and The Wolf of Wall Street. Indeed the DGA went with Gravity, whilst the PGA did the unprecedented thing of award joint winners in Gravity and 12 Years A Slave. The BAFTA and Golden Globe’s went to 12 Years A Slave and they took the main honours too on Oscar night by which point they were odds-on. This year was another two-horse race. Boyhood and Birdman were by far the two leading lights. Richard Linklater’s Boyhood took the Golden Globe and the BAFTA, and many thought it was on course for the Oscar, but Boyhood came from behind to capture the buzz, winning the DGA and PGA honours – but just days before the Oscars – Boyhood was odds-on with Birdman as long as 18/1 but it caused a huge shock by taking the win also beating the fancied The Imitation Game and Grand Budapest Hotel – who both had a buzz pre-Oscar. This still ranks as one of the biggest upsets in recent history. Birdman caused a huge shock 12-months earlier at the Oscars and the Academy members did it again for the 2015 awards with Spotlight taking the honours. There was one movie dominating awards season was Alejandro G. Insrritu’s historial American drama The Revenant starring Leondaro Di Caprio, which claimed the BAFTA, Golden Globe and the DGA – indeed the other movie thought to be in contention was the Big Short – based on the collapse of the American housing market. Spotlight – a true story about child abuse in the Catholic church – was highly acclaimed and amongst the front-runners, but it was still a huge shock when it took the Oscar on the night. So to last year’s awards and the end off shock winners did not come to an end as for the third year running, the favourite did not win. Early in awards season and coming-of-age drama Moonlight was well received and took the Golden Globe and then the BAFTA. Highly acclaimed feel good musical La La Land was the name on everyone’s lips, and was 1/10 to win – 90% probability, but no it was Moonlight who claimed the big award. So onto this year, and we have another two-horse race – but will we see the favourite win out? So far rewards season have copied the previous awards season. The BAFTA and Golden Globe gong have gone to the same winner, with Three Billboards Outside of Ebbing, Missouri taking those whilst the DGA and PGA have gone for Guillermo del Toro’s Shape of Water. Bookmakers are not taking many chances and although Three Billboards is favourite – Shape of Water is not far behind, indeed this looks the closest run Oscars we have seen since 2010 when Hurt Locker edged out Avatar. ◂ Will weather threaten Cheltenham?